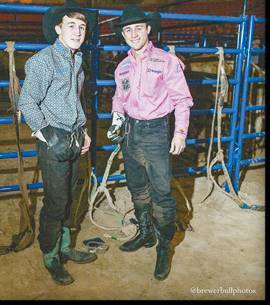 A FAMILY THING…A look behind the South Point Hotel, Casino & Spa bucking chutes of Championship Bull Riding Las Vegas with reigning World Champion Sage Kimzey and brother, Trey Kimzey, who is making his debut on the CBR Road to Cheyenne. Both Kimzey’s plan to make an appearance at the Cheyenne PRCA Rodeo in April. The Cheyenne Old Settlers Association is proud to have been approved by the PRCA and honored to have the opportunity to host a professional rodeo. It takes an entire community to get together and host hundreds of cowboys and their families that will be coming into Cheyenne to compete. Cheyenne and the Cheyenne Old Settlers Association is lucky to have local rodeo dignitaries help promote this special event at our celebration. Give Local & Let The Adventure Begin!